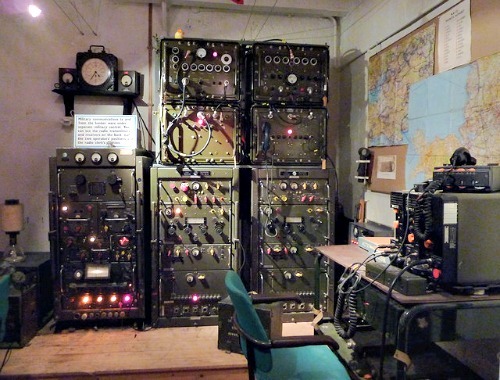 Is Hack Green Nuclear Bunker Haunted? The site of Hack green nuclear bunker was used by the military since world war two were there was a decoy site to confuse German bombers looking for important railway junctions at Crewe. After the war the site was used as a detection center to track any incoming soviet aircraft and a semi sunk reinforced concrete bunker was added. The site was officially known as RAF Hack Green and provided air traffic control services for military aircraft crossing over civil airspace. After the 1950's the site was abandoned for many years and lay derelict. The Home Office eventually took it over and began work to greatly expand the bunker and turn it into a regional government headquarters which was one of 17 sites across the UK. Their purpose was to act as a place for the government to work out of in the vent of a nuclear attack on the UK. After the cold war ended in 1991 the home office abandoned the use of the bunker as one of its 17 post nuclear war command posts and sold it to a private company. Since 1998 the bunker has been open to the public and has an impressive collection of cold war memorabilia, including one of the worlds largest collections of decommissioned nuclear weapons. Why Hack Green nuclear bunker is haunted is unknown as there were no tragedies and no one officially died inside, but the shear number of people who have experienced something paranormal down here cannot be ignored. Ever since it opened its doors as a museum in 1998 staff and visitors alike have experienced some spooky happenings in the rooms of corridors. All of the spirits who have been seen in apparition form are all thought to be past employees of the bunker as they are always seen wearing military uniform. The most often seen such apparition is of a man in the main corridor, who is always seen wearing his uniform and hat. He is seen walking along as if on his way to his work station, often walking straight through anyone who doesn't care to move out his way. He is also accompanied by a menacing energy which has been reported to be so strong that a number of people have actually fainted upon seeing him. The telecommunications area of the bunker, room 9, has the spirit of a young woman who has been seen working at her desk. The room is also home to a male spirit who is thought to be of aggressive nature with tales of people being barged past by an unseen person in this room. Another interesting thing about room 9 is how the old display telephones have been heard ringing from down the corridors when the room is known to be empty, which is especially odd since they are for display purposes only and don't have any type of connection to them. The main hot spot of the bunker has to be the theatre. There are reports of physical contact from the spirits in this area with guests and staff alike claiming to have been touched or even pushed by unseen hands. Noises such as loud bangs and pain filled moans have been heard coming from this area, which is always found to be empty upon inspection.